The event setup section is where all the tournament template options are controlled. When the tournament is first activated, the setup wizard will guide the director though setting up all of the main information for the tournament template. This is where main tournament manager options are set, like dates, times, registration deadlines, and prices are set, along with selecting which division to offer in the tournament. Additional tournament registration items to purchase can also be added for competitors to buy during the registration process. They will be added to the entry total on the registration online summary page when the participant is going through the entry process. The director has the ability to upload up to 20 event sponsors. 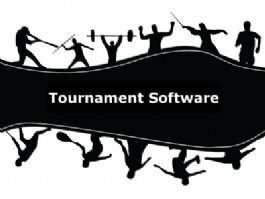 The tournament template website will rotate 4 sponsors on each page the user visits. Further event website customizations include: Uploading a tournament Map, hotel information, and prize money details. After the tournament template is setup and customized, the activation section allows the director to turn on and off specific features. The entire tournament website that the participants can view can be turned on and off. The participants list can be hidden if you don’t want people to see who has registered. When starting times or brackets are ready to be released, they are activated here. Finally after the tournament is over, activating results creates a results summary page of all of the divisions. A director is also able to send 2 email blasts out to up to 5 states in each blast. The email may promote the tournament and have a link to the tournament template website where the players and teams will register. The director may send as many emails as desired to registered tournament players through the email system.